Mtech tactical knife with double edge blade. 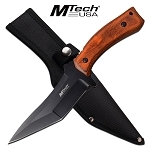 The fixed blade knife is 11 inches overall length. The blade is 6.25 inch 3cr13 steel. Black pakkawood handle is 4.75 inches. Knife is constructed full tang and comes in a nylon sheath. This double edge tactical knife came sharp right outta the box. Sheath is good. Overall its Awesome!